A question about this. I have read other EU proponents calim that the energy of the sun comes from electric currents arriving from interstellar space. I thought, that sounds easy to verify, just sent a probe around one of the poles of the sun to detect this massive current. The energy IMO is more likely stored in the stressed longitudinal magnetic field at the core of the intergalactic filament, but little attention has been paid to such fields. There has been some consideration of the longitudinal field in solar surface flux tubes, but how they could measure such fields entering the Sun at the poles, I don't know. If these events are scaleable over many orders of magnitude, then the Sun in my view is just a smaller scale version of the other flux tube pinches observed, such as the quasar or BH model. But, my mental model still does not have the stored flux tube unergy being sufficient to produce the observed energy output of the Sun, which is why I then need to utilise the energy from the vacuum model, producing at the core of Suns or BHs, the hard gamma energies that are responsible for the creation of matter, and as the energy level decreases with distance from the pinch, all the other observed fields and forces and structures. And on top of that, to really push the limits of credibility of most, is the idea that at the centre of these energetic events may be the theorised magnetic monopole, a spherical longitudinal radiator that is vibrating the Aether out to the limits of the solar system, and in conjunction with the more conventional forces and fields, responsible for the creation of all material manifestations within the Suns sphere of influence. A very high energy, spherical symetry breaking then? The Kibble Mechanism perhaps? What this really means is that many scientists ignored or did not see fundamental biases in the data. Our work showed that previously reported correlations are an artifact of observation – nothing to do with the intrinsic properties of GRBs. The authors suggest another model that can better explain the long GRBs, the cannonball model, but I believe they are still assuming that GRBs are the result of the explosion of massive stars. The important consideration with the article though is that the existing model relies on a "confirmation bias", where existing beliefs about GRBs are confirmed by only looking at data that supports the model. That seems IMO to be applicable to much of present cosmology. 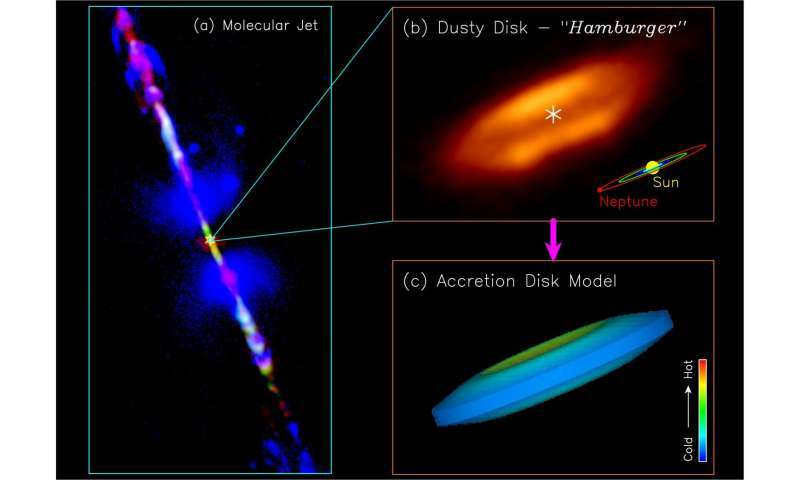 HH 30 is supposedly a proto-sun, with an accretion disk and jets, even though the images acquired so far seem to show something quite different, and by their own words, there appear to be 2 bowl shaped structures. As the observations are refined, then more detail becomes apparent, but this is looking more like there is a spiraling-in component. The balistic clumps supposedly being ejected have not been imaged with sufficient temporal resolution IMO, to determine motion one way or the other, and could be outflowing too. Whatever the source of the bright spot on Ceres, I think the overall view should be giving us reason to consider a totally different model of the formation and surface modification of all the cratered objects observed. The idea that all the craters are from impacts over billions of years, or perhaps during a time of heavy bombardment is looking to me to be more unsustainable all the time, and the idea that they could all be from electrical processes much more likely. Imagine that these bodies were once immersed in a region of very highly ionised plasma, inside of a torus perhaps. Then we might have observed something, at certain wavelengths, that would look more like a plasma globe, with those tendrils being responsible for excavating material from the surface, likely in the search for electrons. The tendrils would jump from one spot to another when they had depleted one area, and a nearby area offered easier pickings. The asteroid belt may have been a very well defined, very active torus at the time of the solar system formation, or when the Sun was in one of its more energetic moods, which I believe occur at relatively short, regual time scales, in the thousands of years range, and that surfaces will be modified every time the Sun 'performs'. The Black Holes they are detecting with their improved instruments are also suggesting more strongly that they have the whole model backwards. If there is a 'Light of Creation' at centre, it would be producing gamma rays of exreme energy, and would be surrounded by great amounts of freshly created matter, blocking the view of the central region. X-rays are emitted during this matter creation, so we can see those, and they will of course be concentrated towards the centre. The image might, as Katerai suggested, indicate that there is only one object at the centre, and not the collective glow from many individual objects. Astronomers have known for some time that supermassive black holes − with masses ranging from millions to billions of times the mass of the Sun and residing at the centres of galaxies − can gobble up huge quantities of gas and dust that have fallen into their gravitational pull. As the matter falls towards these black holes, it glows with such brilliance that they can be seen billions of light years away. Astronomers call these extremely ravenous black holes "quasars." They know nothing of the sort, it is speculation, a model. A backwards model. A group of Victoria-based scientists have made a discovery suggesting that the building blocks of planets may form earlier than previously thought. UVic astronomer, Mike Chen, presented the group's research at a Canadian Astronomical Society's conference on May 25th. Backwards again. Once a star is born by way of the pinch in a cosmic flux tube, it begins creating matter, and silicon-dioxide grains are the most abundant product. They just can't get their heads around that simple fact, and those who might have figured it out are unlikely to say anything, the mainstream media and academia would destroy their reputations and credibility, and thus their financial futures. Don't rock the boat dude, or else. As this is my local University, I've a good mind to go bang on some doors, and then bang some heads together. The Moons of Pluto. How the heck they get that shape? By my theory, Pluto having moons means that it will be found to have a decent magnetic field. Rule of thumb is the greater the magnetic field, the more moons, and the more circular their orbits. 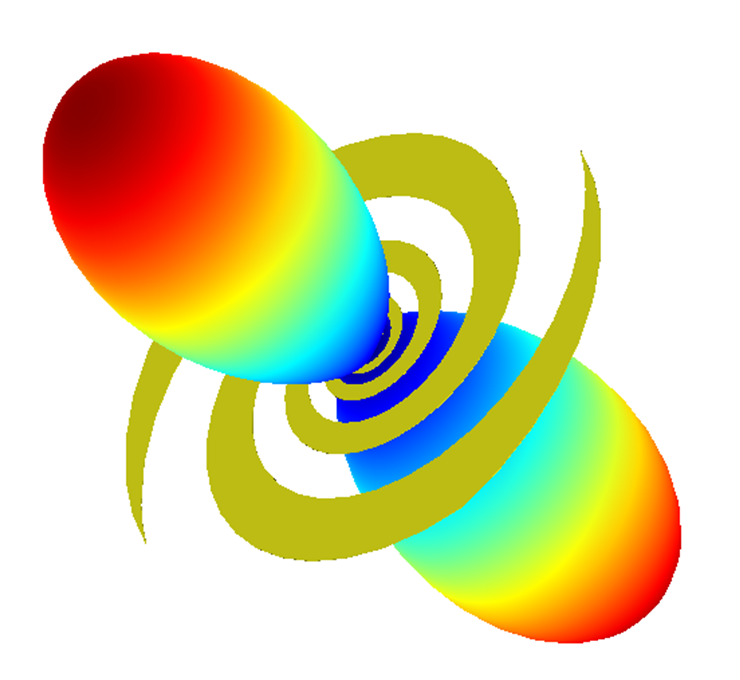 The shape is Coulomb derived, formed in an energetic torus, requiring matter creation, particle acceleration, ion acoustic waves within the torus. This strengthens my belief that at when our Sun first came into existence, the initial magnetic and electrical forces were of such magnitude that it created and shaped the matter that all the planets, and moons, and asteroids/comets too. We are talking a big energy release, but really just a scaled up version of what the Sun can do even now within its flux tubes. The magnetic energy in the Solar flux tubes is soon spent, but if you are draining the energy available in an inter-galactic or maybe even inter-Sun flux tube (and the galaxies may really only be stars after all) then you can create solar systems, and in very short period. Must be getting near time to put up my arXiv paper. 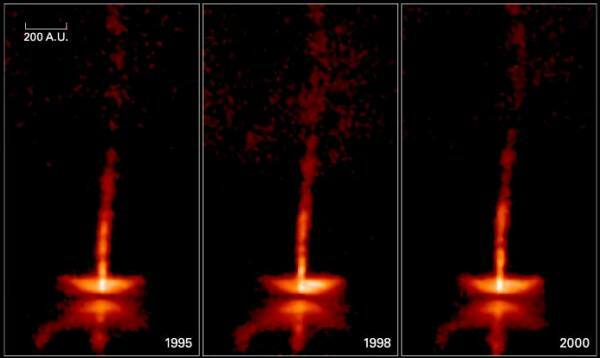 Getting closer, but the scientists are still not seeing the real formation methods, and still think the dust is a remnant of the stars formation, and not being produced in the tori or tubes around the star, and then being shaped by Coulomb forces, ion/electron acoustic waves, plasma-enhanced deposition, and not gravity clumping. Biggest explosions in the universe powered by strongest magnets. Observations from ESO's La Silla and Paranal Observatories in Chile have for the first time demonstrated a link between a very long-lasting burst of gamma rays and an unusually bright supernova explosion. The results show that the supernova was not driven by radioactive decay, as expected, but was instead powered by the decaying super-strong magnetic fields around an exotic object called a magnetar. The magnetar, according to the mainstream model, must have an electric field of around 50 GeV/cm in order to produce the observed magnetic field, which means there must be an almost infinite mass to create charge separation gravitationally. I believe optical rectification of hard gamma rays is responsible for the charge separation, and I think the Ancients knew more that we do when it comes to the true nature of our Sun, and all the energetic phenomena up to and including the Magnetar. The Torah/Kabbalah and Vedic models have the Hidden Light of Creation, with two levels above that where the physical properties begin, the 'light' above the hard gamma energies being metaphysical in nature. Even if we had instruments that could detect this central 'magnetic light', the matter being created around the light would block our view, hence it really is a Hidden Light. Using NASA's Nuclear Spectroscopic Telescope Array (NuSTAR) satellite observatory, the team of international scientists detected the high-energy x-rays from five supermassive black holes previously clouded from direct view by dust and gas. So they are now seeing X-rays through the dust and gas, but how do x-rays relate to gamma rays? And above gamma rays? Will we ever be able to detect the Light of Creation? The distinction between X-rays and gamma rays has changed in recent decades. Originally, the electromagnetic radiation emitted by X-ray tubes almost invariably had a longer wavelength than the radiation (gamma rays) emitted by radioactive nuclei. Older literature distinguished between X- and gamma radiation on the basis of wavelength, with radiation shorter than some arbitrary wavelength, such as 10−11 m, defined as gamma rays. However, with artificial sources now able to duplicate any electromagnetic radiation that originates in the nucleus, as well as far higher energies, the wavelengths characteristic of radioactive gamma ray sources vs. other types, now completely overlap. Thus, gamma rays are now usually distinguished by their origin: X-rays are emitted by definition by electrons outside the nucleus, while gamma rays are emitted by the nucleus. Although I do not support the idea of a nuclear bomb cause of the radiation signatures, I also do not support the close planetary discharge of the TB model, but rather the extreme level solar flare/CME one. The odds of any of the planets coming into close proximity with each other, given the huge volume of space involved, are vanishingly small. It has been know for decades that gamma ray and neutron production occurs in solar 'storm' events, so the mega-CME model would seem to be the logical answer. With a 4 wave mixing model of the Sun though, it is theoretically possible to produce an energy pulse of infinite magnitude, but a lesser event may well be capable of producing the energies that could have caused the effects evident on Mars. Spiral Antenna. The heavens are filled with plasma antennas of many shapes, sizes and magnitudes. "Atoms consist of positive and negative electrons." This according to Ouspensky. If true, this would allow my Light of Creation model to make sense. As with the Big Bang model, there should be the creation of electrons and positrons in equal number, so where did the positrons go? Well, they didn't go anywhere, they are still here, as part of atoms. This kind of stuff makes my head hurt, but I'll stick with it, as up until recently I had not known of the relationship between Ouspensky, Gurdjieff, and Buckminster Fuller, and Fuller is still probably the most influential to me with my own search for a workable model of the Universe. New findings based on a year's worth of observations from NASA's Van Allen Probes have revealed that the ring current -- an electrical current carried by energetic ions that encircles our planet -- behaves in a much different way than previously understood. The origin of water in the solar system and in interstellar space is a puzzle to mainstream. Our Solar System as we know it today formed out of a primordial disk of gas and dust called the Solar Nebula. Of course they know this for a fact, like lots of other things such as black holes and supernovae. 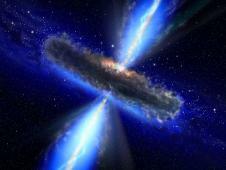 Further afield, water has been detected in huge amounts around a distant quasar. Two teams of astronomers have discovered the largest and farthest reservoir of water ever detected in the universe. The water, equivalent to 140 trillion times all the water in the world's ocean, surrounds a huge, feeding black hole, called a quasar, more than 12 billion light-years away. The numbers presented are of course another fact, if you have any faith at all in NASA and astrophysicists. They really have no idea how far away these objects are, or how large they are, and in (my) reality all these objects are just like our Sun, though magnitudes may vary greatly. They are all based on the plasma pinch. The standard model does not consider the role of electromagnetic forces of course as the primary mechanism, but only arises because of gravitational effects. Our Sun, being an opto-electro-magnetic machine (OEMM, a new mantra for those who meditate on the Sun!) no doubt possesses the mechanisms and conditions to create nano-ice particles, and in the event of a major solar storm, may produce large quantities of such ice, and it may be possible that this ice could enter the Earths polar regions, through the mesosphere. Perhaps the noctilucent clouds are ice particles originating from the Sun? The water vapour source is not known with certainty. Well, I'm not certain either, but mainstream has been surprised quite often so can't count the idea out just yet. I think the fine silica particles in the solar dust disk are also created by the Sun, and a lot of other stuff too. Again the image is misinterpreted. The so called jets are not, they are evidence of the flux tube in which the pinch is occurring and are due to the acceleration of matter towards the pinch, though the matter will consist mostly of electrons. No dusty plasma is required to form a star, the matter is created by the star, as it is by our Sun. All true stars will display the same or similar properties, and all the objects which astronomers tell us are stars are not, what they see is the glowing atmospheres of charged bodies of assorted size planetary objects whos distance is totally unknown. Most so called stars we see from Earth are likely objects in the Oort cloud. Objects identified as galaxies are probably all just stars, and from a distance, using similar instruments, our Sun would appear to be a galaxy. And that is why I think that they cannot find planet 9. There is probably some object in that direction that mainstream place as so many light years away, where in fact the object is quite close and is the size of Neptune.